So it’s a new year and a fresh start! I know a lot of people have organization on their mind as the new year begins. I know I do. Savannah too! We have talked about this very thing. I’m a good organizer when I actually do it. I am pretty organized but I get overwhelmed VERY easily. If I’m tired or hungry (lol!) things are 100x harder for me! Seriously. It makes me cranky and overwhelmed. I decided I needed to start somewhere and take one step at a time. If my home is organized, that will transfer to organization in other aspects of my life. I LOVE BEING ORGANIZED but we all know, it can be tough to STAY organized! I’m starting this week with a cleaning schedule. I found a bunch of great ideas on my “Clean up, Clean up, Everybody do your share” pinterest board. Quite the name I know! hehe! Check it out! You can also ! A big part of organization for me is scheduling. I haven’t been very “scheduled” lately and it kind of drives me bonkers. 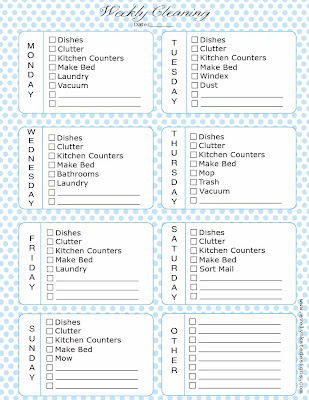 Here are a few cleaning schedules I have been looking at to get an idea for my own! You can use one of these or make one customized to your own liking! 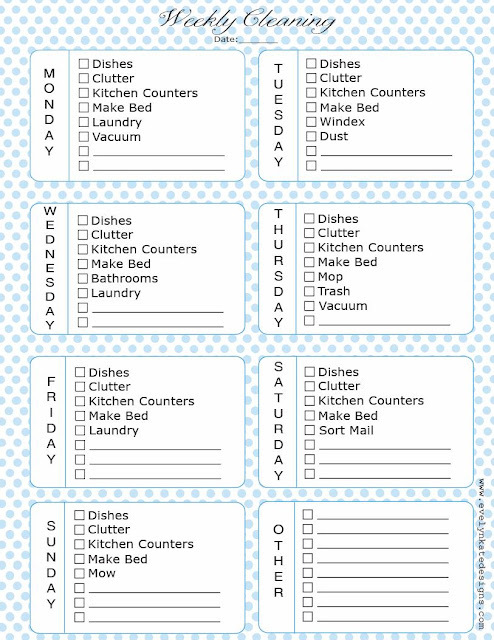 I will be making one of these schedule for my own home and I will share it with you soon! Are you tackling your home? Cleaning? Organizing?